The so-called "public option" -- as it remains in the bills being proposed in the House and Senate -- is a fraud and a sham. It bears no resemblance to the "robust" public option originally sold by its supporters as the most pragmatic, "uniquely American" multipayer way of achieving affordable universal health care, instead of importing successful single payer models from other democratic capitalist countries which provide better health to its citizens at considerably lower costs. The pygmy public option now being proposed in the House and Senate will not be a viable competitor to mandated private insurance. • It will not put any meaningful pressure on private insurance companies to moderate their premiums. • It will not have the market power to pay lower fees to doctors and hospitals than private insurance and will thus not be less expensive than private insurance. • It will not even be available to most Americans. • Since it will be unable to effectively compete with private insurance, it will end up with few, if any customers. At this point, it really doesn't matter whether or not a final health reform bill includes this type of public option in name only. The public option, as it's now being proposed in the House and Senate, will have no meaningful impact. If Joe Lieberman or other corporate Democrats kill this meaningless public option, it will make no difference in the lives of most Americans. With or without a fraudulent public option, millions of Americans who will be required to buy insurance or pay a fine will see their premiums skyrocket as there will be no effective limits placed on how much private insurers can charge the customers whom the federal government will make buy their product. The final nail in the public option's coffin came when House Democrats (with no help from President Obama to twist Blue Dog arms) fell 10 or 12 votes short of including a requirement that the public option pay providers Medicare rates plus 5% and instead will be required to negotiate rates with each doctor and hospital in America. This all but guarantees that the public option will end up paying more to doctors, hospitals and drug companies than private insurance. It's like a brand new Mom and Pop store trying to compete with WalMart. Here's why, without a tie to Medicare rates, the public option will end up paying more to providers than private insurance: The largest private insurers in each market already have tens or hundreds of thousands of members. When they negotiate rates with providers, they get volume discounts of as much as 30%-40% off "retail rates," just as WalMart gets volume discounts because of its market clout. (Because of its even greater bargaining power, Medicare often pays providers 15%-20% less than private insurance). But without the ability to tie pricing to Medicare rates, the public option will have no ability to negotiate volume discounts. It will start out with no subscribers. It will then have to go to each hospital, doctor and drug company to negotiate rates. Without any subscribers at the outset, these providers will have no incentive to give volume discounts to the public option, which will end up paying more than large private insurers. This in turn will make the public option more expensive than private insurance. As a result, it will sign up few subscribers. With few subscribers, it will be continue to be unable to negotiate volume discounts. Even if the public option were allowed to pay Medicare plus 5% rates, unless it already had a large number of subscribers in a particular market, providers would simply refuse to accept public option patients at these reduced rates, prefering to treat patients from higher-paying private insurers. So it's a chicken and egg situation. Few subscribers will lead to higher costs. Higher costs will lead to few subscribers. This is a public option designed to fail. As a result, when the Congressional Budget Office first evaluated the Senate negotiated-rate public option plan, the CBO concluded that it would end up with no subscribers. Perhaps with a little pressure from Congress, the CBO is now projecting that by 2019, approximately 6 million Americans would be enrolled in the negotiated-rate House public plan. The CBO also projects that "a public plan paying negotiated rates would...typically have premiums that are somewhat higher than the average premiums for private plans." The CBO notes that this public plan would attract a "less healthy pool of enrollees" than private plans. With a less healthy pool of enrolees who require more services than private plans, the cost of the public plan would continue to escalate beyond the cost of private insurance, further reducing the number of people who sign up, and further reducing its negotiating clout, leading to a vicious circle of increasing costs and unaffordability that would do little or nothing to put pressure on private insurers to lower their premiums. As Kip Sullivan, a long-time fighter of universal health care, has argued articulately, the devolution of the public option from a robust proposal projected to cover over 129 million Americans and lower insurance costs to a sham public option that will at best cover 6 million Americans in 10 years and have no impact on lowering insurance costs is a case of "bait and switch". 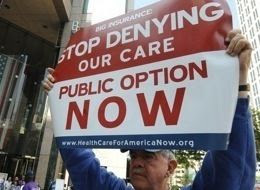 The "public option" was initially proposed by Yale political scientist Jacob Hacker and Campaign for America's Future leader Roger Hickey as a more politically "pragmatic" alternative to the long-time progressive goal of establishing universal single payer health care (as though insurance companies and their paid-for Congressional allies wouldn't fight against a robust public option as hard as they would fight against Medicare for All). Hacker and Hickey laid out 5 criteria that, they argued, were essential to the success of the public option. 1. The PO had to be pre-populated with tens of millions of people by shifting all or most uninsured people, as well as Medicaid and SCHIP enrollees, into the PO, so like Medicare, it would represent a huge pool of enrollees on day one. 2. Only enrollees in the PO, not in private insurance, would be eligible for government subsidies. 3. The PO and its subsidies would be available to all nonelderly Americans (not just the uninsured and employees of small businesses). 4. The PO would pay Medicare reimbursement rates. 5. The insurance industry had to offer the same minimum level of benefits that the PO offered. If these criteria were met, the Lewin Group (a subsidiary of health insurance giant United Health) projected that the public option would enroll 129 million Americans, have overhead of 3%, pay hospitals 26% less and doctors 17% less than the private insurance industry, and have premiums 23% below the private insurance industry average. That was the "bait." Now came the "switch." The puny public option proposals that are still on the table in the House and Senate meet only the 5th of the 5 criteria for an effective public option and eliminate the first 4 criteria. They are not pre-populated; subsidies go to both the public option and private insurance; large employers are barred from buying into the public option; and the public option is not allowed to use Medicare rates but must instead negotiate rates on a provider-by-provider basis. The result is that instead of enrolling 129 million Americans and decreasing insurance premiums, the sham public option being proposed in the House and Senate will enroll between 0 and 6 million Americans and will cost more than private insurance. It's time that organizations which supported a "robust" public option tell their supporters the truth: that the public option in the House and Senate bills bears no relationship to the public option they have been fighting for. (Instead, the Health Care for American Now blog praises the public option in the House bill as "a strong competitor to private insurance, keeping prices down and attracting customers.") Its time that "progressives" in Congress like Anthony Weiner, Alan Grayson, Jan Schakowsky, Raul Grijalva and Lynn Woolsey admit to their constituents that, with no help from President Obama, they've lost the battle for a "robust" public option. Media figures like Keith Obermann and Rachel Maddow, who've been vocally talking up the public option, should be reporting the truth about the pitiful public option that's left on the table. As it stands now, the sham public option in the House and Senate bills serves only one purpose. It gives political cover to progressives and liberals in the House and Senate to vote for mandates that will use the power of the federal government to force uninsured individuals to buy inferior and over-priced private insurance or be fined by the IRS by being able to say, "Well, at least the bill contains something called a public option," even if it's a public option in name only. Better that Joe Lieberman's filibuster threat forces Congress to drop this sham public option from the bill. At least, then, progressives and liberals will have to squarely face up to the implications of their vote and decide if this type of "health care reform" is really in the interests of the American people, or indeed, in the interests of the Democratic Party.